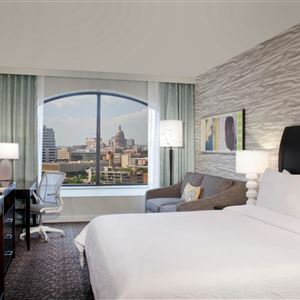 You'll be centrally located in Austin with a stay at Hilton Garden Inn Austin Downtown/Convention Center, minutes from Austin Convention Center and Austin Children's Museum. This hotel is within close proximity of Texas State Capitol and Long Center for the Performing Arts. Make yourself at home in one of the 254 air-conditioned rooms featuring refrigerators and microwaves. Complimentary wireless Internet access keeps you connected, and cable programming is available for your entertainment. Private bathrooms with shower/tub combinations feature complimentary toiletries and hair dryers. Conveniences include phones, as well as safes and desks. Don't miss out on the many recreational opportunities, including an outdoor pool, a spa tub, and a 24-hour fitness center. This hotel also features complimentary wireless Internet access and wedding services. Enjoy a meal at a restaurant, or stay in and take advantage of the hotel's room service (during limited hours). Quench your thirst with your favorite drink at a bar/lounge. Cooked-to-order breakfasts are available for a fee.